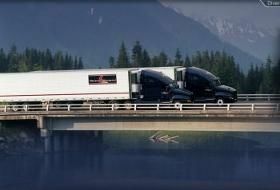 This section provides information needed to pass the tests for combination vehicles (tractor-trailer, doubles , triples, straight truck and trailer). The information provides only the minimum knowledge needed for driving common combination vehicles. You should also study Section 7 if you need to pass the exams for doubles/triples. Combination vehicles are usually heavier, longer and require more driving skill than single commercial vehicles. This means that drivers of combination vehicles need more knowledge and skill than drivers of single vehicles. In this section, important safety factors are discussed that apply specifically to combination vehicles. More than half of truck driver deaths in accidents are the result of truck rollovers. When more cargo is piled up in a truck, the “center of gravity” moves higher up from the road. The truck becomes easier to turn over. Fully loaded rigs are 10 times more likely to roll over in a crash than empty rigs. Rollovers can happen when you turn too fast. Drive slowly around corners, on ramps and off ramps. Avoid quick lane changes, especially when fully loaded. Trucks with trailers have a dangerous “crack-the-whip” effect. When you make a quick lane change, the crack-the-whip effect can turn the trailer over. There are many accidents where only the trailer has overturned. "Rearward amplification" causes the crack-the-whip effect. Figure 6-1 below shows eight types of combination vehicles and the rearward amplification each has in a quick lane change. Rigs with the least crack-the-whip effect are shown at the top, and those with the most at the bottom. 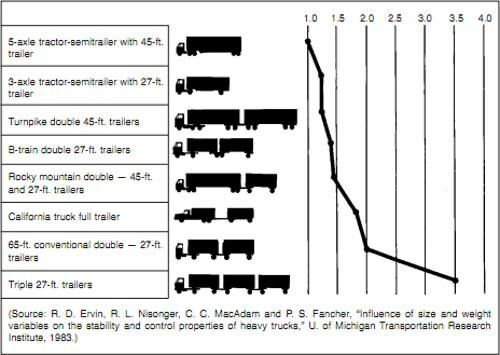 Rearward amplification of 2.0 on the chart means that the rear trailer is twice as likely to turn over as the tractor. You can see that triples have a rearward amplification of 3.5. This means you can roll the last trailer of triples 3.5 times as easily as a 5-axle tractor-semi. Steer gently and smoothly when pulling trailers. If you make a sudden movement with your steering wheel, you could tip over. Follow far enough behind other vehicles - at least 1 second for each 10 feet of your vehicle length, plus another second if going over 40 mph. Look far enough down the road to avoid being surprised and having to make a sudden lane change. At night, drive slow enough to see obstacles with your headlights before it is too late to change lanes or stop gently. Slow down to a safe speed before going into a turn. Control your speed whether fully loaded or empty. Large combination vehicles take longer to stop when they are empty than when they are fully loaded. When lightly loaded, the very stiff suspension springs and strong brakes give poor traction and make it very easy to lock up the wheels. Your trailer can swing out and strike other vehicles. 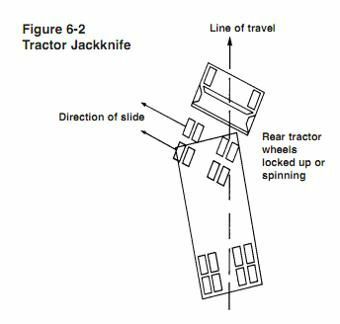 Your tractor can jackknife very quickly (see Figure 6-2 to the right). You also must be very careful about driving “bobtail” tractors (tractors without semitrailers). Tests show that bobtails can be very hard to stop smoothly. It takes them longer to stop than a tractor-semitrailer loaded to maximum gross weight. 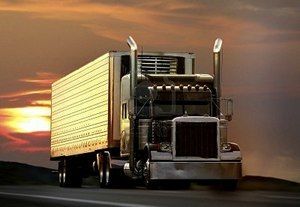 In any combination rig, allow lots of following distance and look far ahead so you can brake early. Do not be caught by surprise and have to make a “panic” stop. When the wheels of a trailer lock up, the trailer will tend to swing around. This is more likely to happen when the trailer is empty or lightly loaded. This type of jackknife is often called a “trailer jackknife” (see Figure 6-3 to the right). Recognize the skid. The earliest and best way to recognize that the trailer has started to skid is by seeing it in your mirrors. Any time you apply the brakes hard, check the mirrors to make sure the trailer is staying where it should be. Once the trailer swings out of your lane, it is very difficult to prevent a jackknife. Stop using the brake. Release the brakes to get traction back. Do not use the trailer hand brake (if you have one) to “straighten out the rig.” This is the wrong thing to do because the brakes on the trailer wheels caused the skid in the first place. Once the trailer wheels grip the road again, the trailer will start to follow the tractor and straighten out. When a vehicle goes around a corner, the rear wheels follow a different path than the front wheels. This is called “offtracking” or “cheating.” Figure 6-4 to the right shows how offtracking causes the path followed by a tractor-semi to be wider than the rig itself. Longer vehicles will offtrack more. The rear wheels of the powered unit (truck or tractor) will offtrack some, and the rear wheels of the trailer will offtrack even more. Steer the front end wide enough around a corner so the rear end does not run over the curb, pedestrians, other vehicles, etc. However, keep the rear of your vehicle close to the curb. This will stop other drivers from passing you on the right. If you cannot complete your turn without entering another traffic lane, turn wide as you complete the turn (see Figures 6-5-A and 6-5-B below). 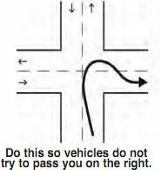 This is better than swinging wide to the left before starting the turn because it will keep other drivers from passing you on the right. If drivers pass on the right, you may collide with them when you turn. More than half of truck driver deaths in accidents are the result of truck rollovers. A higher center of gravity increases the chances of a rollover. Fully loaded rigs are 10 times more likely to roll over in a crash than empty rigs. The next couple paragraphs will discuss the "crack-the-whip" effect. While you don't need to memorize anything particular, you should be able to understand what "crack-the-whip" refers to. Figure 6-1 does not need to be memorized. But you should have a general understanding of what type of what trailer setup experiences the most rearward amplification, thus, leading to a higher "crack-the-whip" effect. Maintain at least 1 second of following distance for each 10 feet of your vehicle length. Add 1 second for speeds above 40mph. Example 1: A 40ft vehicle traveling 30mph needs at least 4 seconds of following distance. Example 2: A 40ft vehicle traveling 60mph needs at least 5 seconds of following distance. We've seen this statement a few times now and it shows up on the written exam fairly often. Always remember to slow down before going into a turn. Quite a few people get this incorrect on the written exam. But it's true, empty trucks actually take longer to stop than fully loaded trucks. You do not need to memorize the actual definition of off-tracking, but you should read the rest of this paragraph and refer to Figure 6-4 to have an overall understanding of what off-tracking refers to. A question or two about off-tracking may show up on your written exam. 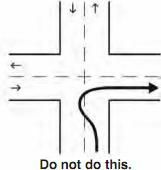 Take a look at figures 6-5-A and 6-5-B and make sure you understand how a right turn should be properly completed. The rest of this paragraph explains why a turn should be made in such a way. It's important for you to understand this turning method and why it's used. What are the two main types of a jackknife? 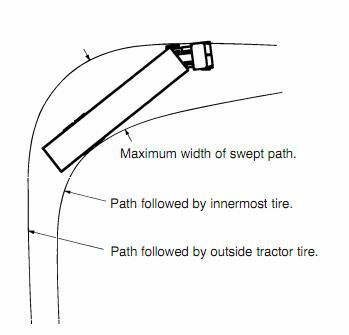 Tractor Jackknife: Rear tractor wheels locked up or spinning. Of all truck driver deaths, how many of them are caused as a result of truck rollovers? 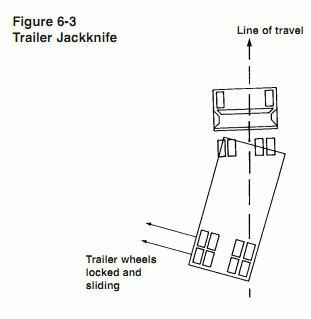 When does a trailer jackknife most often occur? When the wheels of a trailer lock up, the trailer will tend to swing around. This is more likely to happen when the trailer is empty or lightly loaded. This type of jackknife is often called a "trailer jackknife"
When a vehicle goes around a corner, the rear wheels follow a different path than the front wheels. This is called "offtracking" or "cheating." Offtracking causes the path followed by a tractor-semi to be wider than the rig itself. Longer vehicles will offtrack more. The rear wheels of the powered unit (truck or tractor) will offtrack some, and the rear wheels of the trailer will offtrack even more. Steer the front end wide enough around a corner so the rear end does not run over the curb, pedestrians, other vehicles, etc. However, keep the rear of your vehicle close to the curb. This will stop other drivers from passing you on the right. Offtracking is why trucks and large vehicles must swing wide. You often see the bumper stickers which say "this vehicle makes wide right turns" and the reasoning for that is offtracking. Longer vehicles have to swing wide to avoid running the rear of the vehicle (or trailer) up onto the grass, curb, or striking pedestrians or people. Trucks with trailers have a dangerous "crack-the-whip" effect. When you make a quick lane change, the crack-the-whip effect can turn the trailer over. There are many accidents where only the trailer has overturned. "Rearward amplification" causes the crack-the-whip effect. The rear trailer is twice as likely to turn over as the tractor. You can roll the last trailer of triples 3.5 times as easily as a 5-axle tractor-semi. When pulling more than 1 trailer, the rear-most trailer is always at a higher risk of overturning than the front trailer. What does the term "Bobtail" refer to? You also must be very careful about driving "bobtail" tractors (tractors without semitrailers). Tests show that bobtails can be very hard to stop smoothly. It takes them longer to stop than a tractor-semitrailer loaded to maximum gross weight. When will a truck have the longest stopping distance? Control your speed whether fully loaded or empty. Large combination vehicles take longer to stop when they are empty than when they are fully loaded. When lightly loaded, the very stiff suspension springs and strong brakes give poor traction and make it very easy to lock up the wheels. Your trailer can swing out and strike other vehicles. Your tractor can jackknife very quickly. You also must be very careful about driving "bobtail" tractors (tractors without semitrailers). Tests show that bobtails can be very hard to stop smoothly. It takes them longer to stop than a tractor-semitrailer loaded to maximum gross weight. Which of the following can help reduce the chance of a truck rollover? Fully loaded trucks are how many times more likely to roll over in a crash than an empty truck? More than half of truck driver deaths in accidents are the result of truck rollovers. When more cargo is piled up in a truck, the "center of gravity" moves higher up from the road. The truck becomes easier to turn over. Fully loaded rigs are 10 times more likely to roll over in a crash than empty rigs. Rollover accidents are extremely serious! Slow down before your turns, not during the turn. You can always speed up through a turn, but you may not be able to slow down enough to avoid an accident. What is a way to properly stop a trailer skid? 1. Recognize the skid. The earliest and best way to recognize that the trailer has started to skid is by seeing it in your mirrors. Any time you apply the brakes hard, check the mirrors to make sure the trailer is staying where it should be. Once the trailer swings out of your lane, it is very difficult to prevent a jackknife. 2. Stop using the brake. Release the brakes to get traction back. Do not use the trailer hand brake (if you have one) to "straighten out the rig." This is the wrong thing to do because the brakes on the trailer wheels caused the skid in the first place. Once the trailer wheels grip the road again, the trailer will start to follow the tractor and straighten out. Make certain you glance in your mirrors while stopping in slick conditions. It is very important to catch a jackknife early. The more the trailer swings into a jackknife, the harder it will be to recover. Which statement is true regarding driving a truck without a trailer (driving a bobtail)? Driving a bobtail (truck with no trailer) can be very dangerous. Trucks were designed to have trailers attached so driving will be difficult when a trailer is not attached. Which type of combination vehicle experiences the worst type of Rearward Amplification? The rear trailer is twice as likely to turn over as the tractor. You can see that triples have a rearward amplification of 3.5. This means you can roll the last trailer of triples 3.5 times as easily as a 5-axle tractor semi. Rearward Amplification - Trucks with trailers have a dangerous "crack-the-whip" effect. When you make a quick lane change, the crack-the-whip effect can turn the trailer over. There are many accidents where only the trailer has overturned.